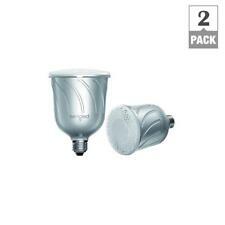 Pulse Dimmable BR30 LED Light Bulb w Built-In Wireless Bluetooth Speaker 2 Pack! 4.5 out of 5 stars - Pulse Dimmable BR30 LED Light Bulb w Built-In Wireless Bluetooth Speaker 2 Pack! 19 product ratings19 product ratings - Pulse Dimmable BR30 LED Light Bulb w Built-In Wireless Bluetooth Speaker 2 Pack! 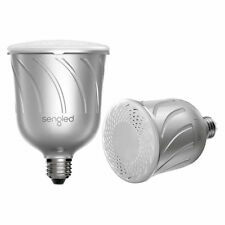 This Sengled Pulse LED Light Bulb with Wireless Speaker is in great condition. 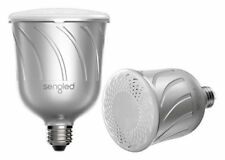 Sengled Pulse LED Light Bulb with Wireless Speaker. Play music and audio recordings while illuminating your house using the pewter Pulse LED Light Bulb with Wireless Speaker from Sengled. 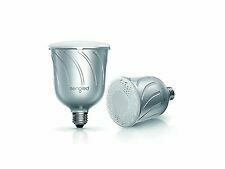 Play music and audio recordings while illuminating your house using the pewterPulse LED Light Bulb with Wireless Speaker fromSengled. Each 8 watt LED light bulb contains a 1.75" multi-channel, full-range, high-fidelity JBL loudspeaker for dual light and audio capabilities. Sengled Pulse LED Wireless speaker x2. Compared to traditional desk-top Bluetooth speakers, the Pulse is a space saver because it is integrated into light bulb socket. It also does not require any power cords or speaker cables. • Pair of integrated 2.4 GHz JBL Bluetooth speakers/LED lights that screw into any standard E26 socket. Set-up is simple. Just screw Pulse into any standard light socket or fixture and enjoy high-quality stereo sound right out of the box. No need to worry about wires, cords or remotes. Best of all, you can customize your Pulse system to suit your needs. Pair of integrated 2.4GHz JBL Bluetooth Speakers/LED Lights that screw into any standard E26 socket. 1.75" Full-Range High-Fidelity JBL Loudspeakers with surround sound effect - perform as Left-Right Stereo pair (13 Watts @ 8ohms; 100Hz-20kHz frequency response). Compared to traditional desk-top Bluetooth speakers, the Pulse is a space saver because it is integrated into light bulb socket. It also does not require any power cords or speaker cables. Wirelessly connect pulse from any Bluetooth-enabled device to enjoy light and sound in a whole new way, Bluetooth transmitter frequency range of 2.40-2.48 GHz; transmitter power: 4 dB, 30 ft. Compared to traditional desk-top Bluetooth speakers, the Pulse is a space saver because it is integrated into light bulb socket. It also does not require any power cords or speaker cables. full-range high-fidelity JBL loudspeakers with surround sound effect - perform as left-right stereo pair (13 Watt at 8 ohms; 100 Hz - 20 kHz frequency response).